I worked at Sinclair Radionics from October 1964 to April 1975. For most of that time I was in charge of the service department. You can read my recollections of early Sinclair Radionics. The Sinclair Neoteric 60 was launched at the Audio Fair at the Hotel Russell, London in April 1968. It was sold until about 1973. The technical information I have on it is dated 1971. 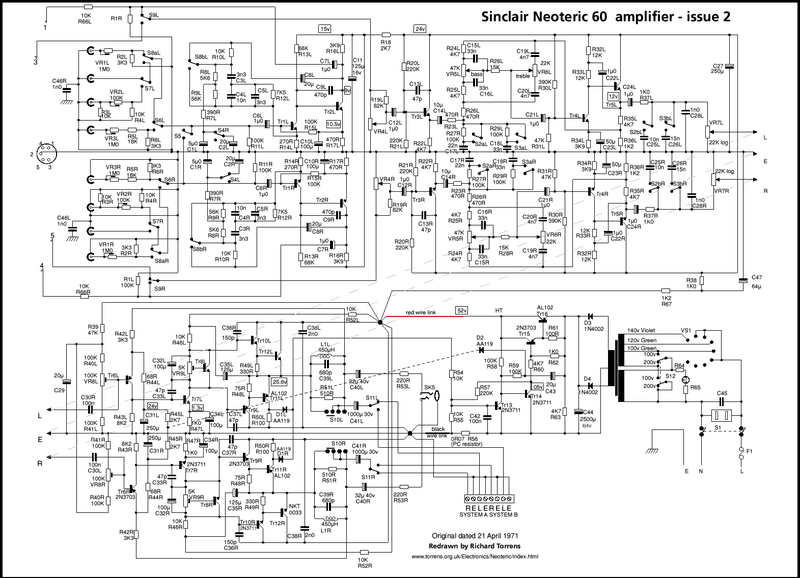 There were two separate versions of the Neoteric 60, which was designed by Martin Wilcox (the circuit) and Ian Sinclair (artistic designer) both under the guidance and control of Clive Sinclair himself, whose concept it was. Clive Sinclair, however, had nothing to do with the circuit design, which is why it was a technically advanced and reliable product. However the initial internal design was done by Martin Wilcox himself: this had sub-modules in it, with connecting wires. It was a complete failure being very difficult to manufacture and almost impossible to repair. It also had a steel chassis and cover which hummed in the magnetic field of the mains transformer. The page on Planet Sinclair refers to this early design which is best forgotten! I doubt whether any of the Mark I Neoteric 60s still exist The adverse information on the www all seems to refer to this failed Mark 1 version. 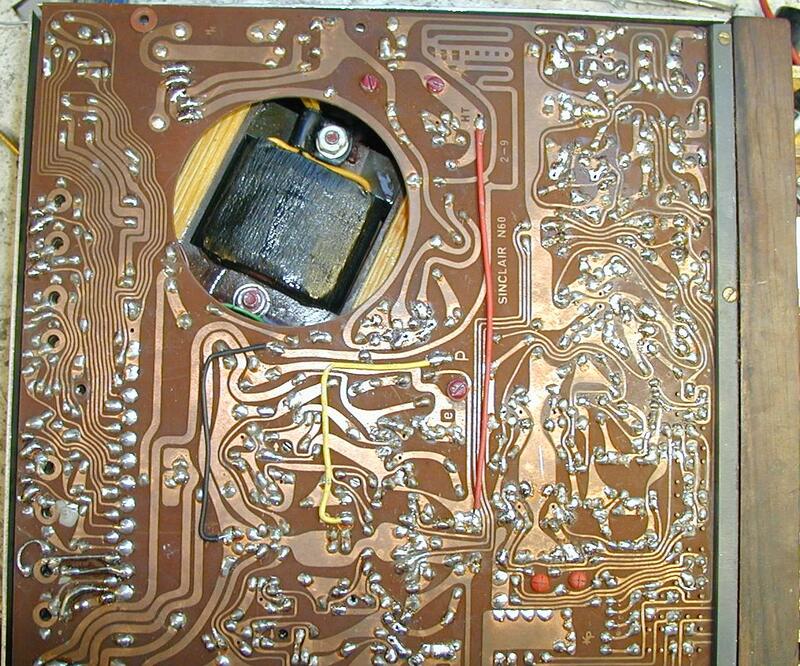 So Clive Sinclair had the board re-laid, a job done by Keith Pauley (you can see his KP logo on the circuit board in the photos), so that everything was on one circuit board. This Mark 2 Neoteric is the version described herein. Chassis and cover were both aluminium, so magnetic hum was removed. The Neoteric Mark 2 was not particularly difficult to produce - though there were many reject rosewood fronts, as the wood tended to break in the wrong place! The Mk 2 Neoteric was also much easier to repair! The circuit boards and the metalwork were manufactured by Harvey Hall Electronics Ltd. in Thetford, who also assembled the amplifiers. 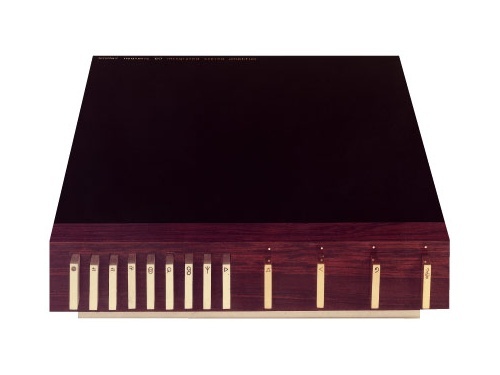 The Neoteric ws never produced in high volume - the Rosewood frnt panel was expensive, partly because of the high reject rate. Also there was quite a lot of manual labour assembling it. The aluminium chassis was also intricate and in the 1960's technology of pressing out such items was crude so this caused problems when screw holes between items did not mate properly, so assemblies had to be re-worked. Circuit diagram re-drawn by myself. PCB photo. The Neoteric 60 with cover removed. PCA layout showing component numbers. More photographs, to help with component identification. 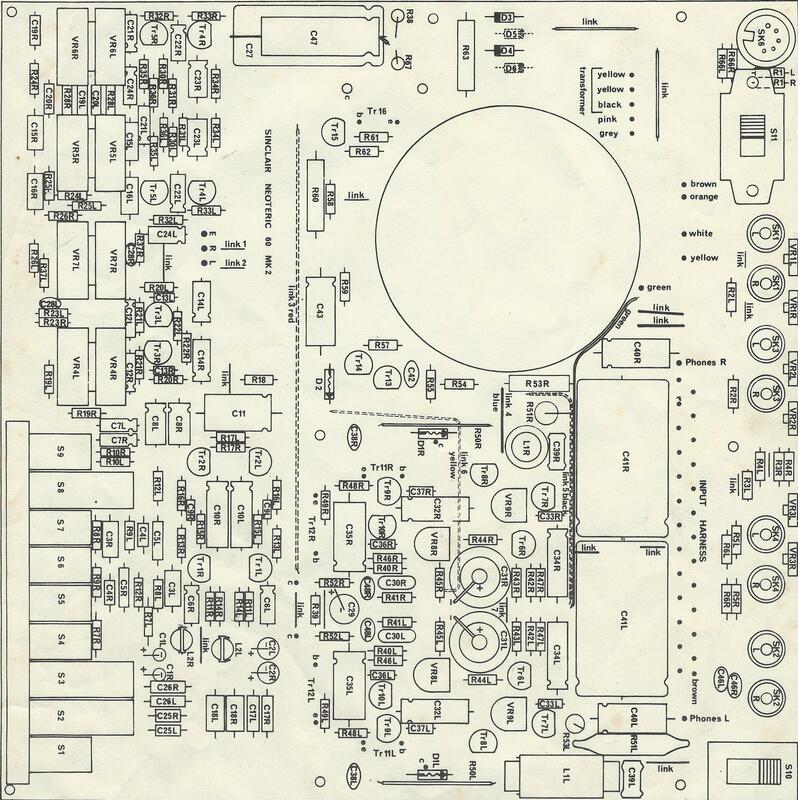 Sinclair Radionics technical information sheet on repairing the Neoteric 60. Sinclair Radionics: an inside view recollections and technical data on other products. I have some spare parts for the Neoteric, and can help with repairs and advice, so please contact me. On the forum HiFiSubjectivist Dr Bunsen Honeydew states that the Neoteric is a Class D amplifier. It is not - it is standard class AB. He also says If owning an original isn't your top priority, give Iain Sinclair a call. Word from the man himself is that an updated reissue would be considered, if there was enough interest. Indeed, Iain's www site did at one time offer to reprodice the Neoteric if there was sufficient interest. On the page Retro chic says "Despite tons of interest and plenty of orders the Neoteric '60s design complexities made it difficult to produce in large quantities, which means they're rarer than a Frenchman's steak." The Mark 1 was difficult to produce. The Mk 2 not nearly so bad - the main problem was with the Rosewood front panels. There were lots of rejects - more failed than passed. Routing out complex shapes in wood is chancy - much depending on the grain of the wood. A modern Neoteric would of course use plastic. Written by and © 2015 - 2019 Richard Torrens.